Here are some facts about Rochester Castle. Rochester Castle is located in Rochester, Kent (in South East England). It was built on the east bank of the River Medway and it is near to Watling Street (a Roman road). 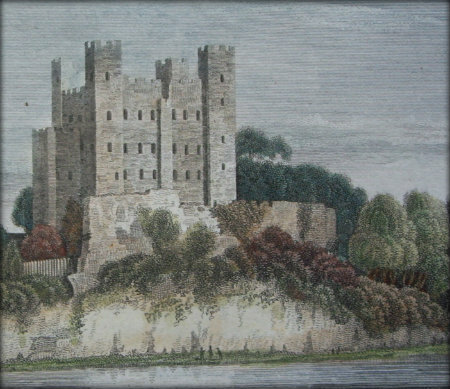 The first castle at Rochester was constructed by the Normans following their victory in the Battle of Hastings in 1066. This early castle was made of wood and was controlled by Bishop Odo (William the Conqueror’s half-brother). In the late 12th century, Gundulf, Bishop of Rochester, built a new stone castle on the Rochester site. Some evidence of this original stonework can be seen today. In 1127 King Henry I gave the Rochester Castle to the Archbishop of Canterbury. Archbishop William de Corbeil built the large stone keep that is still standing today. Rochester Castle has seen its fair share of military action. Baronial forces captured the castle during the First Barons’ War and defended it for over seven weeks from the forces of King John. In 1216 Prince Louis of France managed to capture the castle from King John, but it was soon returned. In 1264, Simon de Monfort led a successful attack against Rochester during the Second Baron’s War. In 1381, during the Peasant’s Revolt, the castle was attacked and captured. It sustained substantial damage during this last assault and it stopped being used as a military fortress. In the 17th and 18th centuries, some parts of Rochester Castle were in a state of ruin and others were still being used. Some of the stone of the outer wall was sold as building material, yet some of the towers were still being lived in. Turner completed a painting of the ruined castle, and Rochester Castle also appears in The Pickwick Papers and The Mystery of Edwin Drood by Charles Dickens. Medway Council now look after the property and it is now open to the public as a tourist attraction. Here is a link to the English Heritage Rochester Castle page. Find out more facts and information about castles by checking out our castles resources page. Thanks for using Primary Facts, Natasha. Glad we were able to help you out! Thanks for using Primary Facts, Mai. Glad we were able to help you with your revision. Thanks! I was doing a project labelling the main parts of a castle and what they were for and we had to reasearch a medieval castle so I chose this one. After visiting the website, I think this is almost better that the actual official website!